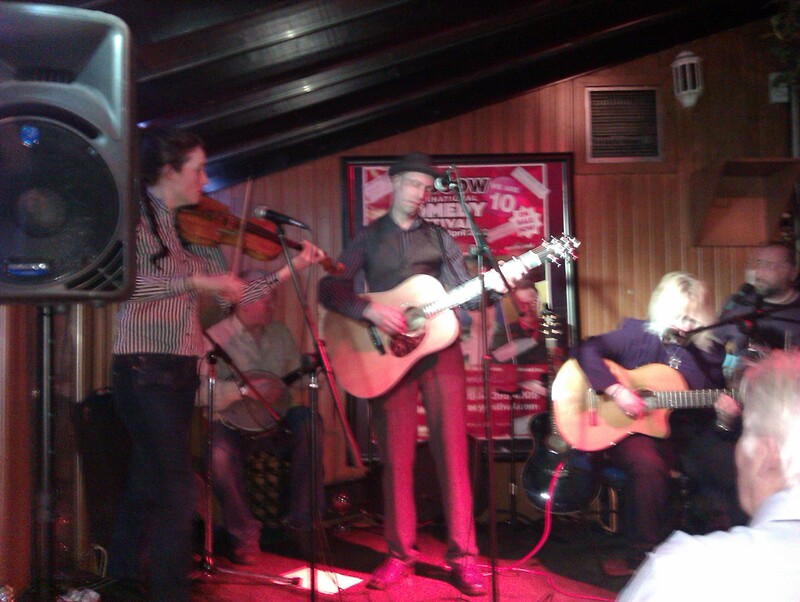 Jim Byrne album launch. The Innocent. Glasgow singer/songwriter Jim Byrne’s last album, Every Day is Sunshine gathered some fine reviews with comparisons to Tom Waits and Johnny Cash among others. Perhaps it’s down to his smooth baritone but fine praise indeed. Two years down the line and Byrne has his third album in the trap and Blabber’n’Smoke went along to hear the unveiling. The launch gig was held in Brel in Ashton lane, a place I’ve always found difficult to enjoy due to its layout and the intrusive noise at times from the bar. However a pretty full crowd crammed into the narrow conservatory to see and hear Byrne and his band The Blackwoods and to a man (and woman) they were not disappointed. The Blackwoods (brother Peter Byrne, occasional bass, percussion including cajon, and freedom boot, Graham Mackintosh, banjo and guitar, Elanor Gunn, violin and Dinny, guitar, bass, autoharp and vocals) proved to be an excellent troupe swapping instruments and styles with ease and managing an occasional set list confusion with good humour that fitted the down home and family type feel of the evening. Byrne himself was a perfect host with an engaging manner that connected well with the crowd. Launching into the new album, The Innocent, they opened with the first song from the disc, Fancy Wooden Box, a death row ballad that would have sat very comfortably with Mr. Cash himself. This was a great performance with the violin, banjo and freedom boot giving it a stomping good delivery. Three songs in the band proved their worth with a fine performance of Down By the Wildwood, a song from his second album that fused some scintillating gypsy guitar duetting and fine fiddle playing with a flamenco hint of mystery and menace. This was our favourite of the night and one would have relished more of the same. However Byrne’s muse appears to favour a home spun folky idiom that flavoured the rest of the evening with covers of I’m Thinking Tonight of my Blue Eyes, Satisfied Mind and a cracking version of Make Me a Pallet on the Floor, all of which were as comfortable as sitting in front of a fine log fire. Best of all was a rollicking boozy rendition of There Stands the Glass which Byrne nailed with a fine looselimbed performance. Mention must be made of Ms. Gunn’s playing, she has a fine tone and at times was exquisite. Bar the lack of a moustache I was reminded of Bobby Valentino who used to play with Hank Wangford. Songs from the album that were aired included Two Empty Chairs, its jaunty air masking a tale of betrayal that came across as a mixture of Leonard Cohen and the Harry Lime theme. Sand in Your Shoes and Sweeter Than a Rose were sleepy waltzes that recalled the likes of Hoagy Carmichael and Bob Wills, a fine tincture for what was outside a cold and wet night. Also from The Innocent was a very touching and emotive cover of Big Star’s supreme tale of teenage longing Thirteen which had some fine guitar from Graham Mackintosh. Byrne commented on the laid back content of the album several times as he introduced yet another ballad but at the end they encored with a superb delivery of Daddy’s Car from his first album On these Dark Nights. A singalong song very much in the style of Loudon Wainwright or Woody Guthrie’s kiddies songs it was a grand way to end a fine little gig. The opening act was a short performance by one of The Blackwoods, Dinny herself who proved to be a fine singer and who delivered an all too short set which was folky but at times had the louche torch song approach of kd lang. This entry was posted in Live and tagged Brel, Jim Byrne, Linny, The Blackhearts. Bookmark the permalink. ← Dave Desmelik. Deep Down The Definition.